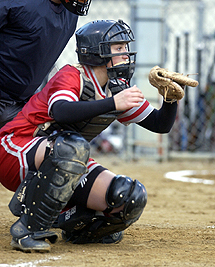 Of the four teams in the 2003 Centennial Conference softball playoffs, only one name is different from the quartet that competed for the 2001 and 2002 titles  and that is only because Western Maryland changed its name to McDaniel. For the third straight year, Muhlenberg will join Ursinus, Gettysburg and McDaniel as the Big Four of CC softball vie for the league championship this weekend. Junior Kate Dischino hit .343 in CC games and has an overall batting average of .340. The four schools have combined to win every CC softball title since the leagues formation in 1994. 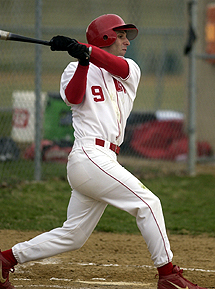 Muhlenberg won in 2000, before there was a postseason tournament, and in 2001, the first year of the tourney. The Mules (11-18, 10-6), who finished fourth in the CC, will go in as underdogs. They were swept by both McDaniel (23-6, 14-2) and Ursinus (21-8, 12-4) and split with Gettysburg (23-7, 13-3). Muhlenberg opens up the double-elimination tournament against defending champion and tournament host McDaniel, which outscored the Mules 29-4 in their regular-season doubleheader. Were very eager to play McDaniel again, said senior first base Kelly Berg, who hit .396 in CC regular-season play. Theyre a very good team but if we put everything together we hope to pull out a win. Weve been through the tournament twice. We know what it felt like when we won and we know what it felt like when we lost, so we want to focus on winning, she added. The winner of the CC Tournament receives the leagues automatic bid to the NCAA Tournament. The Centennial Conference baseball playoffs are designed to make things as difficult as possible for the fourth-place team. Thats no problem for Muhlenberg, which has made a habit of coming from behind. Senior Justin Rubenstein leads the Mules in batting average (.389) and RBI (33) and has stolen 17 bases. game travels to Johns Hopkins to face Ursinus (22-11-1, 12-5-1) on Saturday. Top-seeded and sixth-ranked Hopkins (28-5, 15-2) awaits the winner for a best two-of-three series. Given the same uphill march last year, Muhlenberg advanced to the championship series against Johns Hopkins before dropping two games by a total of three runs. In the first regular-season game against McDaniel, Muhlenberg trailed 9-3 with six outs to go before falling, 9-8, in a game that ended with the tying and winning runs in scoring position. The Green Terror completed the sweep with a 10-3 victory.